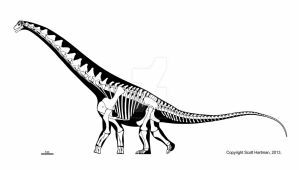 Too many paleo-artists seem to forget dinos had more than just starved mummy flesh painted minimally on the bones. You go the route of them having actually lived, with organs and integuments. Cool! This is one of the most impressive things I've seen here to this day. Thank you. It took me a while to make, though it's not perfect (not perfectly aligned, at any rate). that's actually pretty cool. 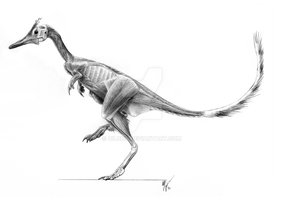 I guess I always knew they were reconstructing the inner workings of these animals, but all I ever see are renditions of the skeletons and of course, the skin or plumage outer layer. There aren't that many workers who do this, or if they do it's a snapshot. The only Dorling-Kindersley books on ancient animals produced a few books using models of cutaway views of animals that did a lot of what's seen here, but they also never got some details right: especially the pulmonary system. This is modern and up-to-date with current research. This is so dang awesome!! I only have one question. Why is there cardiovascular tissue going in to the feather shafts? Are they still growing? Or is this just a view of possible cardiovascular paths throughout it's life? Demonstrating that at some point there is blood supply to the feathers? This is just a view of possible pathways. There is additional blood supply to the feathers, and the remex/retrex artial and venal vessal are the largest recipients, so only they are shown. I can remove these structures for a more "settled" arrangement. Naw, looks fine, gets the point across that there is blood flow there during growth! Very interesting. 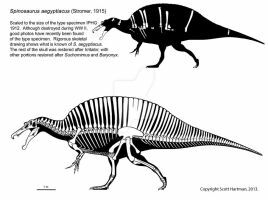 Makes you think, which is something I believe all good paleoart should do. Very not-seen-before approach, but I gggotta ask - what did you base it's skull on? Nemegtomaia barsboldi, which may be closer than we've all thought. They come out as sister taxa in enough reconstructions to allow this. This is partially covered in the link. Superb work! I think I've never seen someone plunging so deep into dinosaur anatomy! I try! Greg Paul goes a fair bit deep, but for the most part sticks to respiratory theormodynamics and energetics. I prefer to be more holistic. Jaime, that is perhaps one of the most outstanding work you've ever produced. I bloody love it. The level of details and the accuracy in this work is simply amazing. Bravo! I like it a lot, personally, and I thank you, Elijah. It needs to be fixed, there are some errors especially as pointed out on my blog. Mind-blowing! Despite your concerns, the muscles look very well rendered with ink in this resolution. 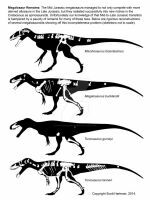 Are the nervous and cardiovascular systems based solely on these of modern archosaurs, or there is some additional info used? They are based on general nervous/cardiovascular systems for vertebrates, which don't differ all that much in general form. Brain, the heart and kidneys, which are shown there, as well as the large glycogen expansion/sacral ganglion of the distal spine, are essentially basic stuff. There's even the recurrent pharyngeal nerve, which even in birds as in crocs loops waaaay down the neck and around the aortic arch to come back up to the hyoid region. It is a bit trickier with the heart as the heart isn't shaped the same way in birds/crocs as it is in mammals, but the essential branches are there. Only the arterial system is shown. In mammals, the carotic arteries run down the sides of the vertebrae, but in birds and crocs, they run mostly down the ventral sides, so this is also shown -- somewhat. No other special reference was used. Thank you for the additional info and explanations! Ha! Yes, that was what my brother wants me to do with this. Also, a gif of the layers receding to the innermost structures. This will require extra work in which I layer the systems together and proper lace them together, requiring more intricate work than shown. i love this one to bits! 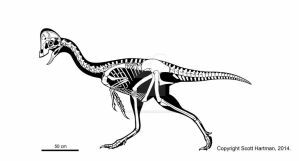 You, good sir, are truly the oviraptorid guru. LOL. Maybe people will remember me with this one! That musculature face is pretty freaky! Yes! Rather than present the skeleton beneath the muscles, and thus the muscles in context, I decided to show *JUST* the muscles. It makes for an interesting image. Do we have any way of knowing how birdlike the pulmonary system was? Yes. Birds, and to a degree crocodilians, have a lung that lies within a larger pulmonary sac. In mammals, this sac is limited to the volume of the bronchial sacs that we normally think of as "the lung." 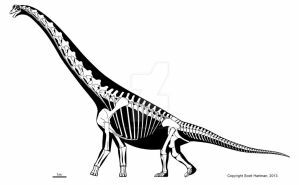 But in archosaurs, this tissue is much more expansive and extends into surrounding tissues, between organs, or into the spinal cord and alongside vertebrae. These are diverticulae, and they allow the bird to pump air from around the whole body into the lung rather than trying to inflate the lung directly, so less work is needed to move more air. When these diverticulae touch bone, they start absorbing bone tissue and move inside, forming pneumatocoels. 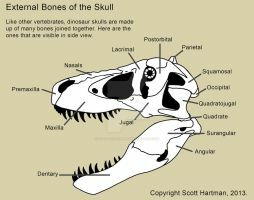 We see evidence for these pneumatic structures in bone in the shoulder girdle, vertebrae, ribs, ilium and other pelvic bones, femur, and the skull. 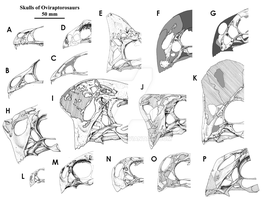 All of these are pneumatic in oviraptorosaurs. In birds, some of these diverticulae ONLY arise from specific substructures that arise from the lungs, so the sacrum and tail diverticulae come from the abdominal airsac, etc. 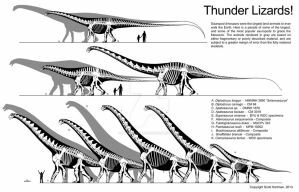 These tell us that animals like sauropods and carcharodontosaurids have intricate and extensive bird-like pneumatic diverticulae. As thus, were very, very bird like. Birds just also have these structures; they didn't originate them on their own. Dang! You go in depth with these pictures!!! Eh, it's good to keep this as a reference work. For further analysis. It can change when I find something wrong, or it's pointed out to me.